Today I welcome Catriona Hoy, author of The Little Dinosaur, to Spinning Pearls. 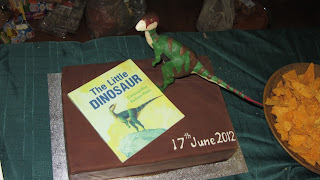 So - I hear you had a blast at the Little Dinosaur launch? Will you tell us about that? Hi Sally, thanks for having me over here today. Yes, it has been a hectic couple of weeks but it was great to see everything finally coming together. It was a bit scary a few days beforehand as suddenly the numbers of rsvp’s doubled and it looked like possibly 200 people were coming! I started to panic about whether I had enough food or wine and made a few extra trips to the shops. I did have an awesome cake made by Cecilia, a multi-talented lady who I teach with. The key to the success of the whole event was the choice of venue. I held it at the Monash Science Centre, where many years ago the whole story began when I interviewed fossil preparator Lesley Kool for a series of articles for Pearson’s magazines. The Science Centre was very supportive and it was just the ideal venue. Dr Pat Vicker-Rich works there and it is her daughter Lleaellyn that the particular dinosaur in the story was named after. Pat welcomed everyone to the Centre and then Lesley Kool spoke about her work. She had everyone enthralled and was just as inspiring as when I first met her many years ago. There were lots of dinosaurs and fossils for both young and old enthusiasts to admire. The science centre were also very helpful with advertising and I can’t praise the entire staff highly enough. How did the Monash Science Centre get the dinosaurs on display? Did they set out to obtain them, or was it serendipity? The Science Centre is open to the public and has an educational focus. When I first began chatting to them about holding the launch, they were planning for a new exhibition. It was a bit of serendipity and a lot of hard work over the weekend on the part of the staff but they managed to get some of the display up and running for the weekend. In particular Corrie and Wayne were putting things together all Saturday and Sunday. It worked well for all of us, I got a great launch and they were able to show the centre to people who didn’t know about it. In particular they had a model of a Lleaellynasura. A lot of people think of dinosaurs as being HUGE. Why do you think the little ones get so little press? Much of the books about dinosaurs in the past have been about Northern Hemisphere dinosaurs. That was one of the reasons I wanted to write this book, about Australian dinosaurs. They were generally smaller and had particular features which has led them to be called ‘polar dinosaurs.’ Back in the Cretaceous, what is now Australia was much further south and was joined on to Antartctica. However, because the whole planet was warmer, the area actually supported a wide variety of life. 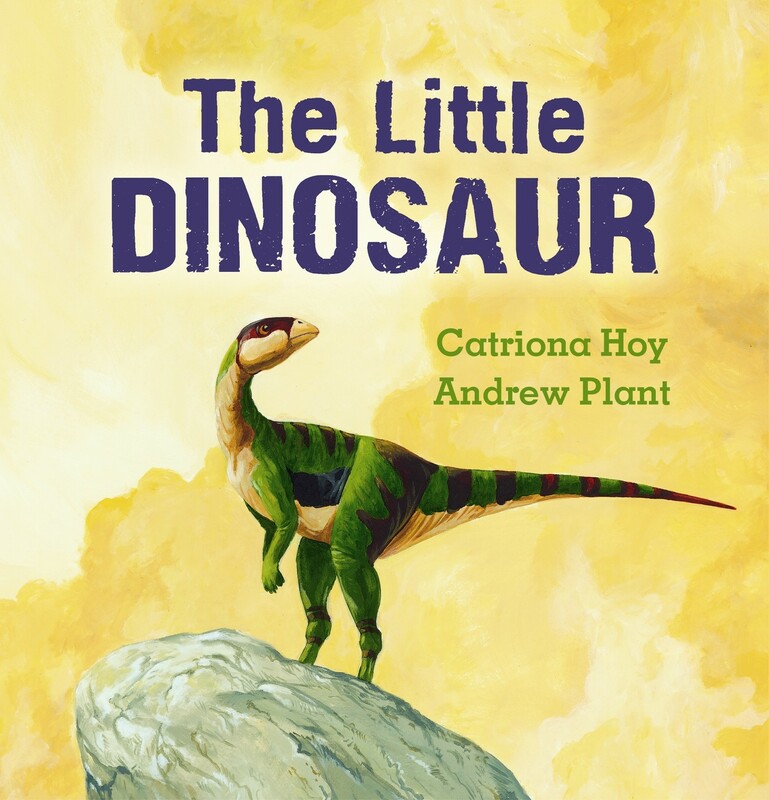 Some of these little dinoaurs had features such as large eye sockets which suggest they could see in the dark. It’s nice to see them get their time in the sun, in a manner of speaking! In the early days of paleontology, scientists often put the bones together incorrectly. Do you know any examples of how they eventually got things right? Sally, it’s not just paleontology…all of science is like that. It’s a constantly changing world where a hypothesis is proposed and tested, accepted and then suddenly some new evidence comes along which challenges everyone’s ideas. Each new discovery teaches and leads us to re-evaluate our world and I think that’s a great thing. So perhaps nothing is ever ..’right’…merely ‘righter?’ When I was interviewing Lesley, she told me a story of a little mammal bone which was found at Inverloch, which caused a lot of controversy because it showed that mammals existed far earlier than scientists had supposed. It surprised me that some dinosaurs had feathers. I know that in the process of working out how bones go together paleontologists look at the sites where tendons and ligaments would join and work out how they would move, compared to animals living today. It’s a fascinating story and made all the more difficult because full skeletons are rare. Often it is only a few bones or parts of bones.